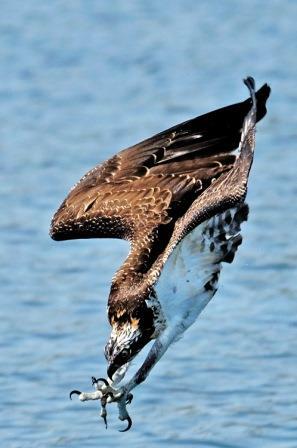 Osprey diving with wings folded, head first and at the last second thrusting its talons downward into the water. The osprey is the only raptor that will plunge into the water to catch a fish. Photo: Rodney Cammauf/National Park Service. If the anticipation of this Sunday’s NFC playoff game between the Seattle Seahawks and the San Francisco 49ers whets your curiosity about hawks, or you just want a good place to hike this weekend, consider one of the many recreation areas managed by DNR, such as West Tiger Mountain Natural Resources Conservation Area. This 4,430-acre site is 35 miles east of Seattle and protects a vast variety of rare ecosystems and many species of native western Washington wildlife. Children can delight in knowing they are walking through the habitat of deer, cougar, bobcats, black bear, coyote, elk, red-tailed hawks, osprey (AKA SEA HAWK), owl, and woodpecker. This area is an excellent outdoor classroom with an education shelter, interpretive displays, and accessible trails. Head into nature today! Studies show that nature exposure and education can help students excel in classroom subjects as well. The trip can also teach kids about the importance of state-protected rare species and their habitat. So, grab your children (and their friends) and hit the trail. Rain or shine, grab your Discover Pass and head out for some extra-curricular activities!